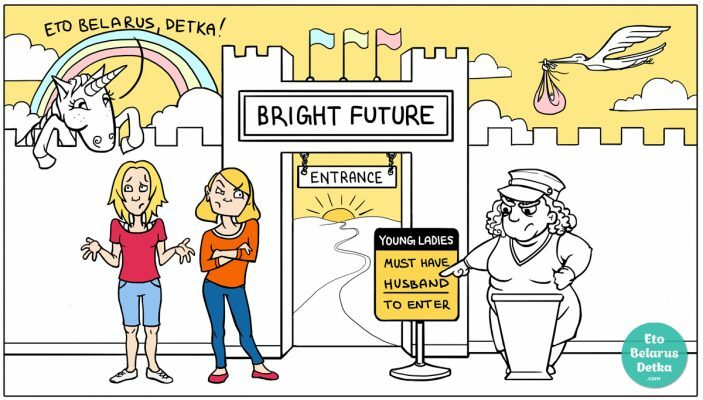 Imagine this scenario: you are a well-educated young lady. You study to become a doctor and conduct a research for your PhD on HIV prevention. And now imagine the first question that your family, friends, or colleagues ask. It’s not about your studies or your career but instead is: ‘When are you getting married, the clock is ticking’. And now you start to panic and think: what the hell is wrong with me? Where is my good looking prince in a convertible, with a shiny diamond ring and a nice house? This question can be asked in any private or professional context in Belarus. And usually by 50+ people in your network. There is the feeling that the measure of success is counted by whether you are married by 25 or not. However, men also undergo the same measurements. But they have a little more time before the society starts to ask the BIG question. We have experienced this situation more than once, and usually can laugh about it. Probably this is because we know this is the older generation talking who have not experienced the change in times. And perhaps they don’t understand that today ladies and gentlemen would like to work on their careers. And build up a stable home for their kids to grow up in. But of course secretly hoping that the prince in a convertible will drive by soon. This is Belarus, baby!